Another Saturday, another day at the farmers market in Aspen, where we have secured a solid space amongst the other booths that are filled with fresh produce, colorful artwork, and unique crafts. In our space, we always plant our large freezers firmly on the ground. The great white freezers hold cuts of fine grass-fed, grain-finished, beef. The various cuts are just waiting to be turned into delicious family dinners or backyard BBQ goodness. With the variety of options that we offer, the possibilities are endless. Along with the cuts of meat, we offer several additional items, including the always popular beef jerky. If you swing by at the right time, you might catch one of us handing out free samples, and hopefully that is enough to entice you to grab a bag for yourself or a friend. You’ll also find dog biscuits nestled in between the Nieslanik Beef hats for sale. Also, since we are talking dogs, we do sell dog bones as well. You’ll also see us repping amazing products from the Marble Distilling Co., feel free to ask us why when you stop by. The Aspen Saturday Market is a great place to spend a couple hours on a Saturday, where the streets are abuzz with live music as locals and tourists meander and intermingle, and there is a variety of food, artwork, and accessories to partake in or to gawk at. All of this is set in amongst the captivating views that Aspen has to offer, with cascading mountain peaks, pristine historical buildings, and sweeping valleys. There is a lot to discover, and along your way we hope that you will stop by to snag a cut of meat or two, trust us, your taste-buds won’t hate you for it. After more than 50 years of work, our main man John still looks for ways to help out wherever he can. He spent some time on this particular afternoon helping fill out beef orders. After the orders were filled, Grandpa took a short break with Parker and the dogs to crack open a bag of jerky, kick the tires on the happenings in the beef business, and reflect on life in general. These generational moments are an incredible reminder of where we have been, which provides a little bit of insight into where we are headed. More than anything, the dogs appreciated the time, the conversation, and most importantly a strip or two of the fresh jerky. There's always work to be done on the ranch, so breaks like these don’t typically last long, but they are worth every moment. The road is a winding, rocky, and well worn path down to the cattle grounds that are stationed just below Carbondale. Just off in the distance the Roaring Fork River churns as the surrounding valley sinks into the depths below the mountains. We find ourselves encased in vibrant colors, with massive red walls in the distance, sprawling green fields below, and cascading blue skies above. 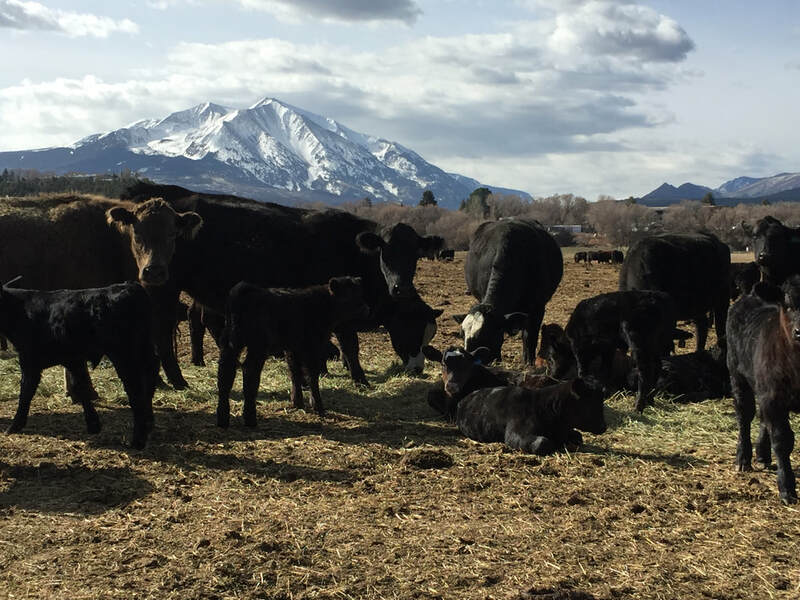 We take in the views, and with each bump in the road we are reminded of the long-standing history of the Roaring Fork Valley. As the truck tires tread along the path, we take care to weave in and out of the small craters in the dirt that were dug deep into the earth by years of use. The slow roll through is enough to kick up small swirls of dust along the path, agitating the history within the land. The road includes several checkpoints along the way in the form of sturdy gates, that when swung open announce their presence with rusted cheers. They only impede the truck’s progress for a moment, as they are swung open to let the truck through before being chained shut again. The journey ends when the volume of the cows calling out in the distance hits the peak in a crescendo of mothers calling to their calves; the calves calling back to their moms. We park our truck amongst a row of trucks, tractors, trailers, and other various equipment just outside the corral where the calves are being held. As the truck settles into a parking space, the engine is lulled to sleep with a turn of the key. Off in the distance a group of people adorned with dirt splotched cowboy hats, tucked-in button down shirts, rugged jeans, and broken in boots, are working to pull calves into a smaller corral, about four at a time. The sound of the branding irons being kept hot in the background adds to the noise and controlled chaos of the day. With around a couple hundred calves to brand, we know we have a good day's worth of work ahead of us. 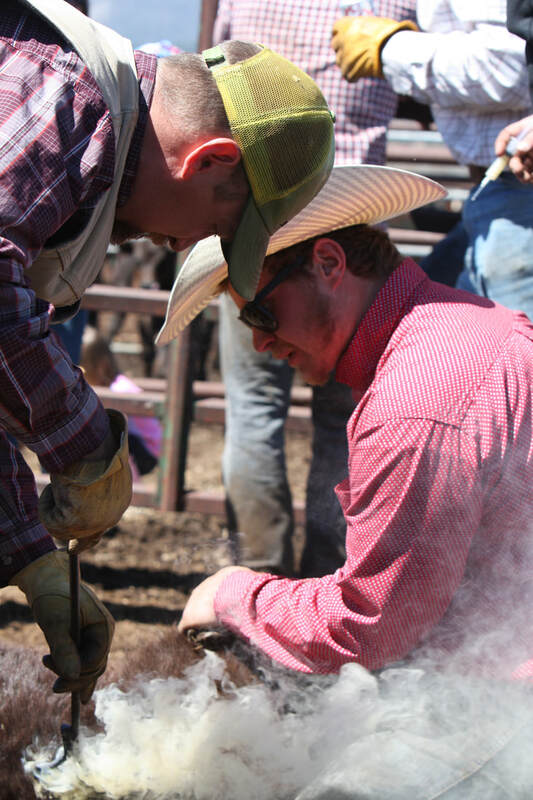 The goal is simple, yet the process takes concerted effort: with two people holding a calf down, there are at least a few others circling the groups to administer shots, tie on rubber bands where necessary, and brand the calves with artistic precision. 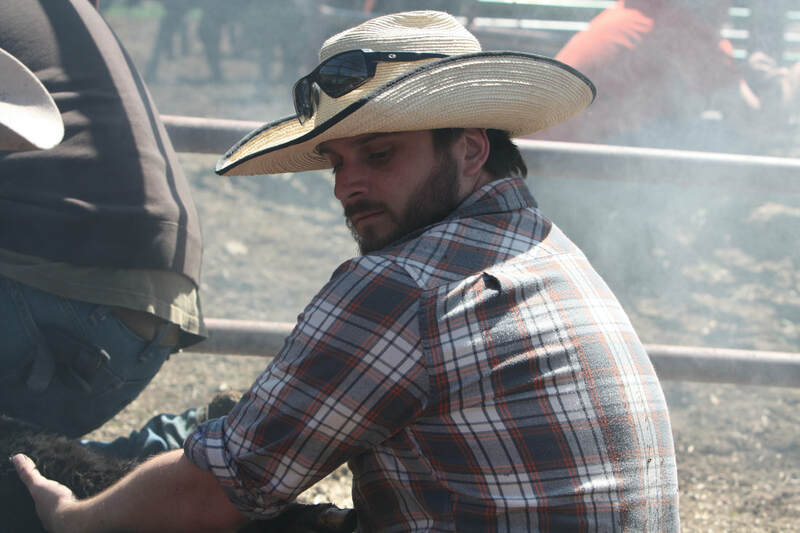 Considering that this is just the beginning of our day, it becomes clear that Branding Day, and ranching in general, is a massive undertaking that requires impressive work and resolute dedication. 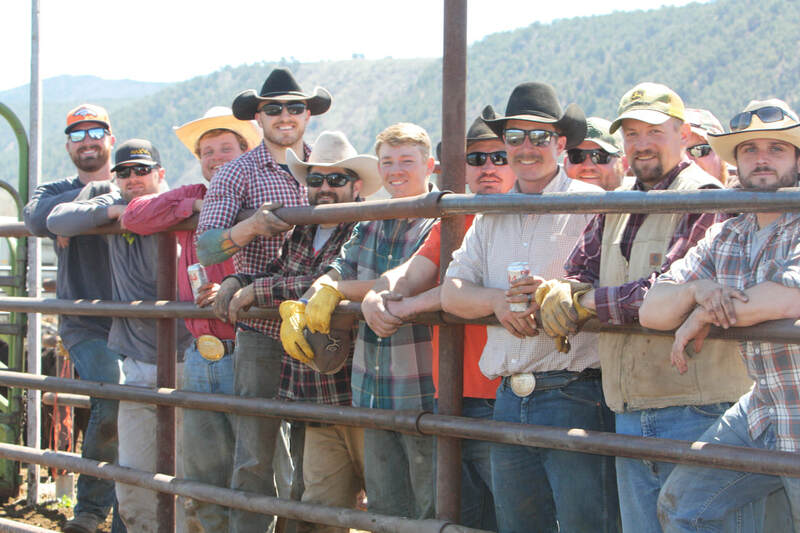 Branding Day represents much more than cattle being, well, branded. Every April, Branding Day represents a gathering of friends and family, and whether it is your first, second, or twentieth time out, you feel a strong sense of community that has been developed over the years. 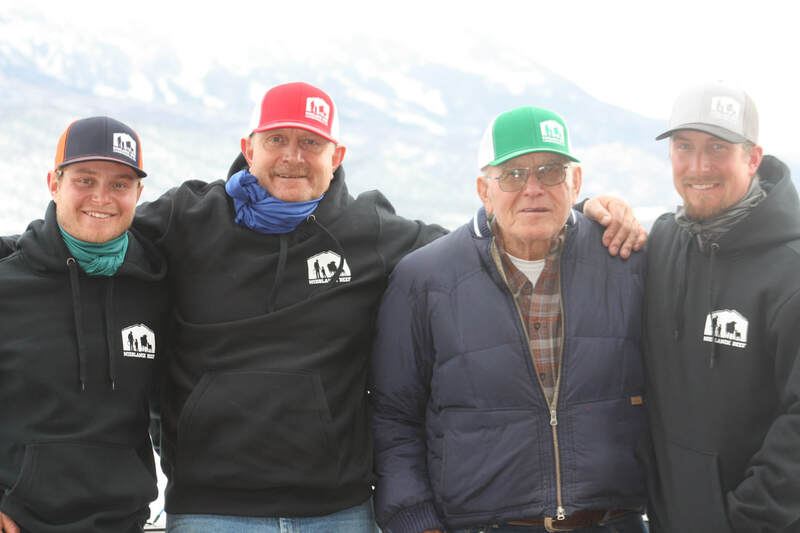 We know of people that fly or drive in from out of town, people from other ranches around the valley, generations of Nieslaniks, wives and girlfriends, and long-time family friends that commit to Branding Day to do whatever they can to help out. They show up because it’s worth it to help out a family that, year after year, raise their cattle in the best way possible. 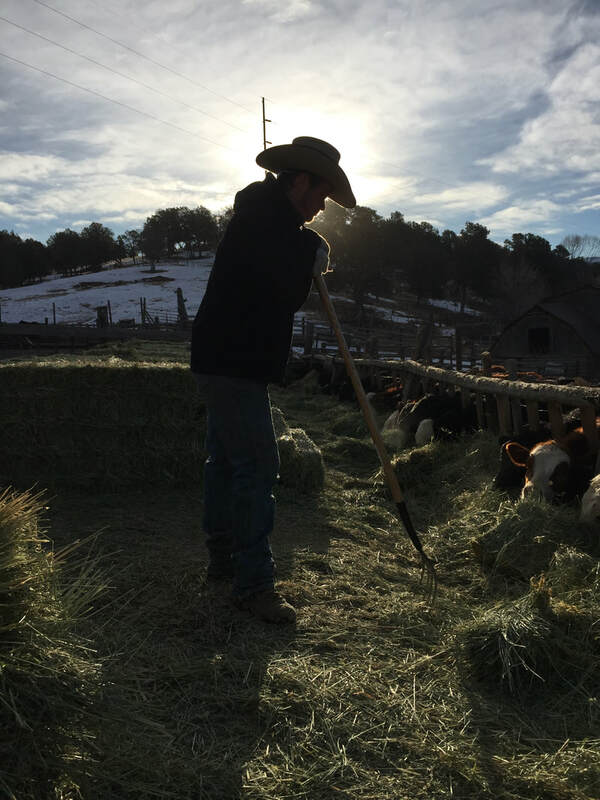 There are people among the group that started helping out with Branding Day as kids, and now their kids are watching on and learning part of what it takes to create a successful cattle enterprise. In all their interest, there are even moments where the kids get a chance to participate; to jump into the pen and help hold down a kicking leg or two, or to simply hang around their dad’s neck to add an additional challenge to holding down a calf. 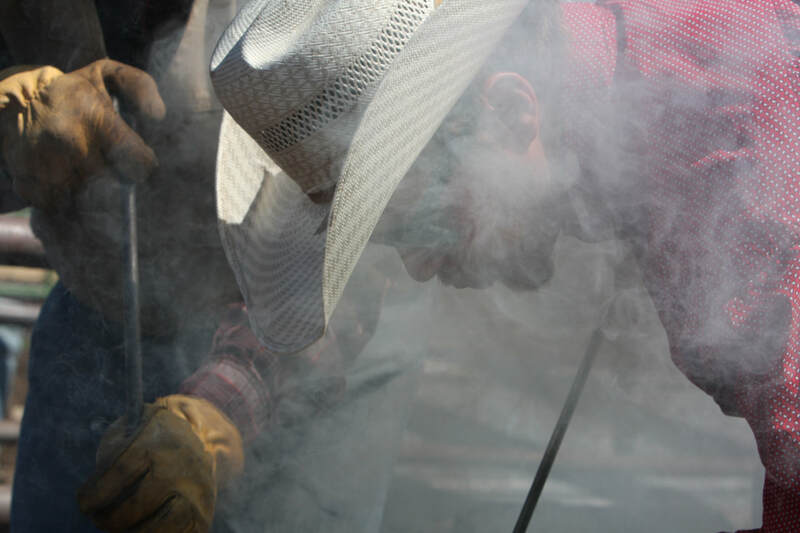 It’s in these finer moments that Branding Day stands out in our minds, it’s a day to come together and celebrate family and friends, and the business that brings us all together at least once a year. The hours of work put in during the day culminates in what can only be described as a ranch inspired feast back at the ranch house. Appetites are fierce at that point in the day, the adults typically gather around the amazing spread, looking like they just went through the wringer. Some even have their pant legs rolled up, airing out their freshly developed knee and shin bruises. Laughter and camaraderie reverberate off the walls of the ranch house as we dig in. Off in the distance, Mt. 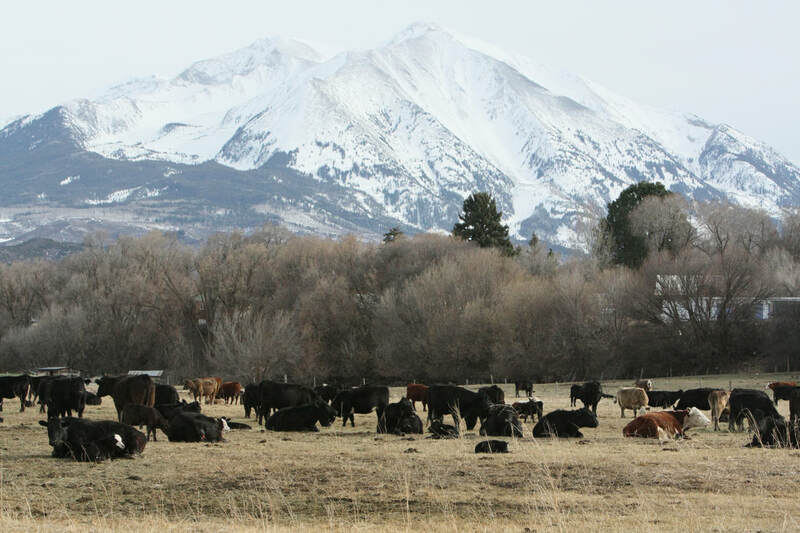 Sopris highlights the views from the ranch as the day winds down, and as the kids continue to run circles around the house, the adults sink lower into their chairs. Branding Day is a long day, and it’s a long day well spent; the friends and family make sure of that. It's a heifer! 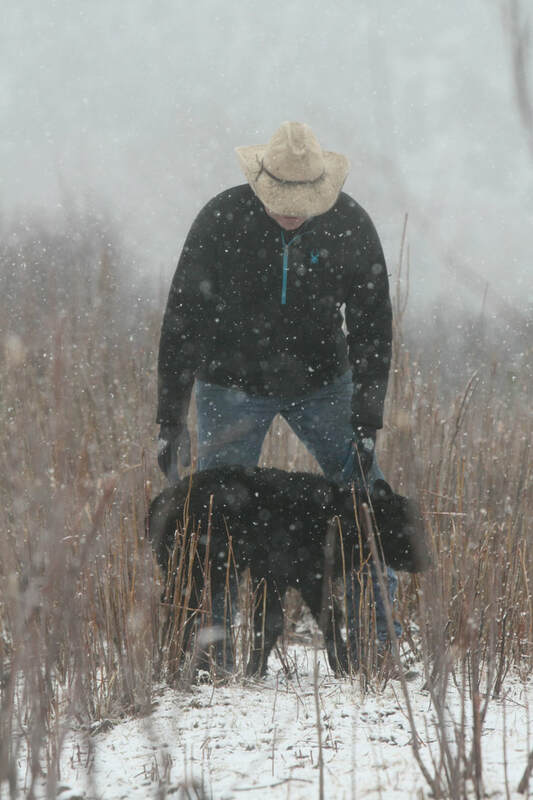 Tag #858 hit the ground on a snowy February morning and she was very lucky to have a man in a cowboy hat to help her along. ​It's uncanny his ability to help his four legged friends. 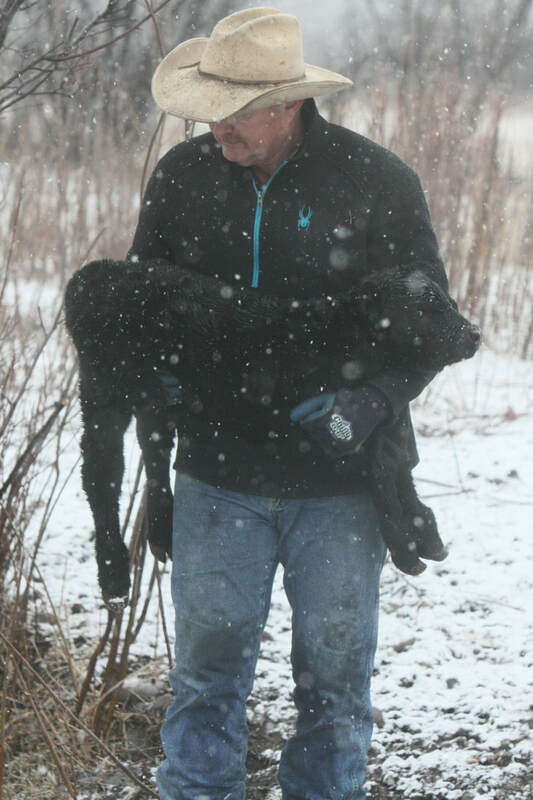 His gentle way and strong work ethic makes it possible to watch over the mother herd during calving season. ​It's a round the clock job. No "attaboy", no raise, little sleep, and no days off. But this life is something so etched into his soul that saving #858 is all he needs to carry on. Roosters really do crow... before dawn. When that alarm goes off morning is upon us... and it's time to do the chores. Rule number 1: Get up. Don't nestle back under your covers. It'll just make you feel guilty knowing the animals are hungry. Rule number 2: Get dressed without looking outside. You have to face the elements no matter what, so why know it's only 10 degrees? No point in peeking out a frosty window into the darkness. It just makes you want to break rule number one. Rule number 3: When your done feeding, stop for a moment. Listen to all the critters happily chewing. Enjoy the warmth from the sunrise and know this is just where you want to be. When it comes to seasons, we commonly know them as winter, spring, summer and fall. But ranchers, well they go by different seasons all together. Take January for instance. To us it means calving season. We have 300 mother cows who are about to start having babies! This means round the clock watch for the next couple of months with Grandpa John (1st generation), Marty (2nd generation), Parker and Johnny (3rd generation), and Jerilyn and Cara all taking shifts. Keep a lookout for the first Nielsanik Beef calf of 2018. Will it be a bull or heifer?